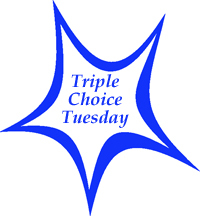 Triple Choice Tuesday first began in March 2010. It is a semi-regular series in which I ask some of my favourite bloggers, writers and readers to share the names of three books that mean a lot to them. The idea is that it might raise the profile of certain books and introduce readers to new titles, new authors and new bloggers. This page will be updated as and when new participants take part. It was last updated on 24 June 2017. I was wondering if anyone has ever asked you about your three most important books. I’d love to, if I’m not too late!